What do YOU use to tow your track car? - Page 60 - Miata Turbo Forum - Boost cars, acquire cats. We service several of these in the shop I'm currently at. They eat tires, and even with a decent alignment can't seem to keep tires on them for very long. Funky vehicles, very functional, some shortcomings and poor build quality in some areas. 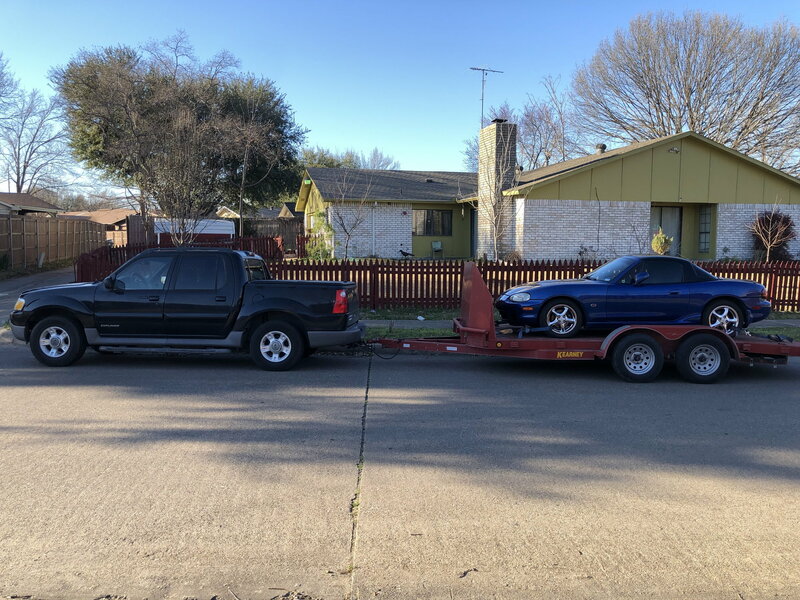 This probably belongs in the CL thread, but I figured anyone looking for a tow rig would be following this one. This thing popped up on another forum this morning and is a pretty good deal if you're in the SW and looking... price would probably be double if it were a truck. Not mine, and no affiliation. Yeah that whole vehicle just creeps me out. I can't put my finger on it exactly, but overall it just seems wrong. The new rig I’ll be picking up in a week or so. 2001 Ford Sport Trac. 4.0L V6. Tow capacity 5000lb. This pic was before I increased rear max air shocks from 30-60psi. Installed external transmission oil filter and have a temp gauge. Everything ran well and got 12.25mpg mostly 65-70mph highway. Damn. I've been wanting a 2001 Sport Trac because it's the last year Ford put the 5.0 in the Explorers and you can still legally (and easily) swap it. How DARE you put that wonderful thought in my head! Thanks for slowing the Miata fund hehe. Your gonna be pissed to know this car was gifted to me for tow purposes and surprisingly works beautiful. For $650, I couldn’t resist. 335k.2wd 7.3 Original owner, started,ran drove great. Did an oil change,filters and re-ringed the fuel bowl. Bed is crud from the rails up, has a wood 4x4 stuffed between the frame and bed. It was a masion truck since day 1. Wasn’t really looking, but this was on a lawn as I was passing so I stopped. Glad I did. 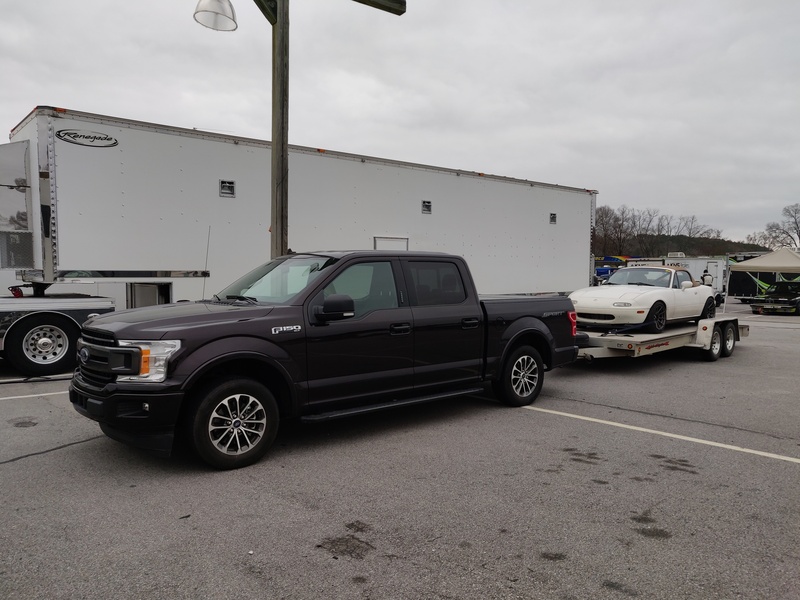 Just towed my turd from Greenville SC to VIR and back on a single tank of gas. Love this thing and it's 36 gal tank. Even got 17mpg. The new rig with my 24’ maxxd drop n load. Oh **** you actually did that. Wow. Sure did, lol. Bought it off of Discovery Channels show Street Outlaws star Bobby Ducote. Flew down to Mississippi and drove it back to New Mexico. 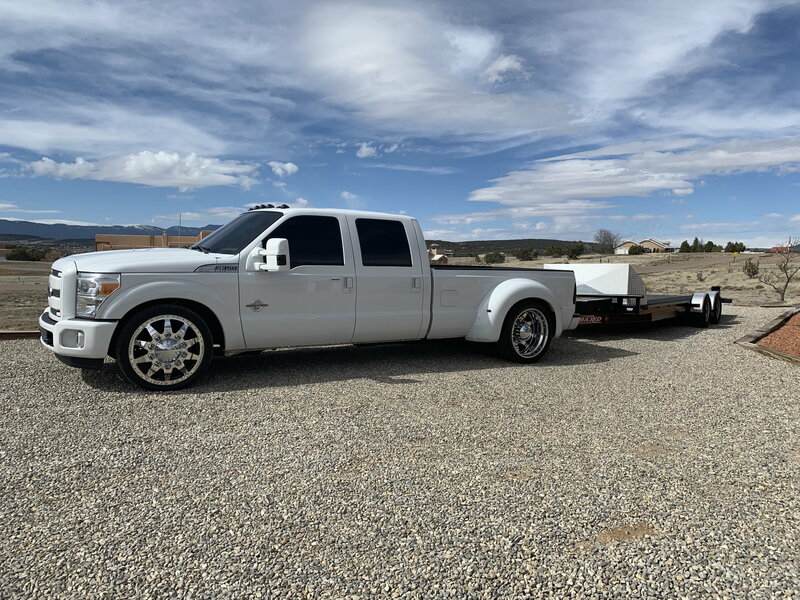 Basic details: 2011 King Ranch with black platinum interior throughout, 40k miles, and of course custom everything, wheels, interior, sound system etc etc. Fully deleted, tuned, exhaust, convertor and a few other things. Hope to have a pic with it towing the miata in a few months. What a dumb thing to spend money on. 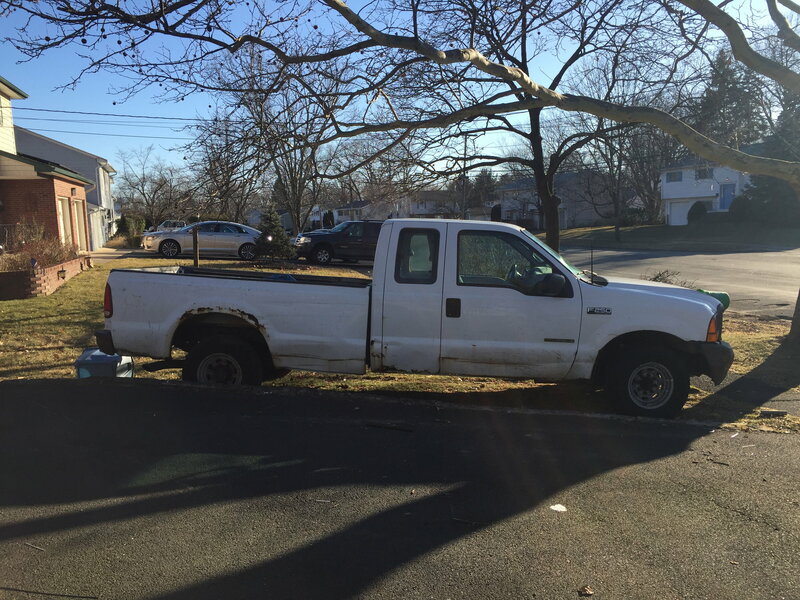 How much is a set of tires when you inevitably have a blow out? What's the GVWR on those wheels? What's the GVWR on those wheels? Was wondering that...? 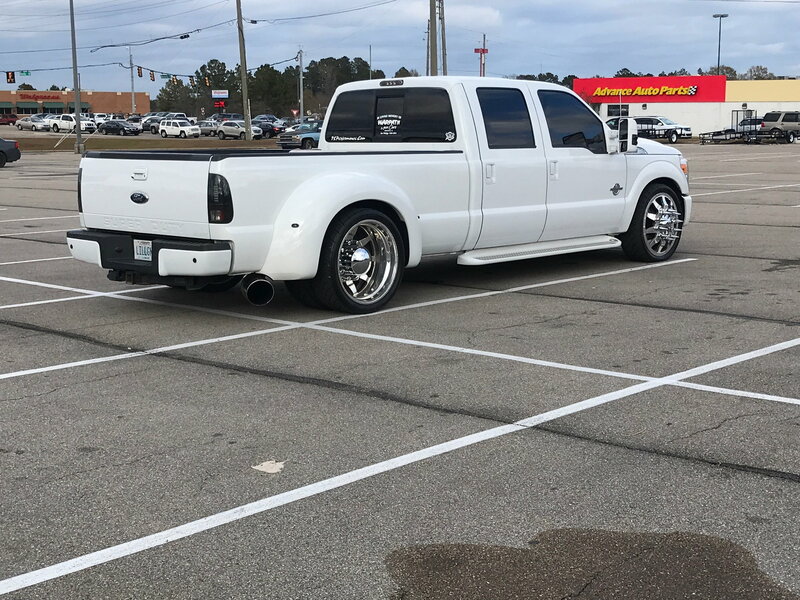 Is it still actually usable as a dually, or are you stuck with bumper pull? EDIT - should have been more clear... curious about the tire ratings, not wheels specifically. Last edited by Roda; 03-25-2019 at 03:30 PM. The wheels should be designed to meet the rated load at the hub, which depends on the lug pattern (that truck is 8x180 IIRC). Dono if it's got a true 10-lug conversion or if the wheels just appear that way. I would be far more worried about the tires than I would be the wheels. I've been looking at a 1992 F-250 custom for a very fair price. Rear wheel drive, standard cab, 8 ft bed, 4.9L inline six motor. 200k miles, decently clean, everything works, little/no rust, straight body. I would need to add a Class 3 hitch, right now it just has the ball on the bumper. Trying to figure out what the rear end gears are. Anything to be aware of here? I've heard the inline 6 has good torque and mileage, and goes pretty much forever. Would use to tow the Miata on a flatbed trailer, and generally abuse in a way that I would not do with my daily. In 1992 the 4.9L straight 6 was rated at something like 140hp and 260lb/ft torque. It's a great workhorse motor, and perfect for an F150 for a runabout or off road, but it wouldn't be my choice in a 3/4 ton truck of that vintage for towing anything. I'd look for a similar vintage F250 with the 460 V8. Would probably get similar mileage and tow a LOT better. I can't really imagine a scenario where that truck would be better than a clean late 90's F150 or chevy 1500. You can buy those trucks in very nice shape in 2wd for $3k and they're far nicer to drive while still offering plenty of capability to tow a Miata. My '98 GMC Sierra was a very nice truck and did the job of towing just fine. Even with the small V8 it had almost 100hp on that 4.9 straight 6 ha.